I visited the Azores in October 2017 and did the Green Island Trail. I was lucky to get a direct flight from London Stansted to Ponta Delgada, Sao Miguel and was then collected from the airport; a short 15 minute or so transfer to Quinta da Terça where you are based. You can read my blog here. Quinta da Terça dates back to the 17th century and contains 5 en-suite rooms available to guests. These are decorated in the Portuguese style of dark wood and traditional furniture so you feel like you are stepping back in time. There are currently 48 horses in total with about 20 available to ride. The horses are extremely well cared for and truly loved. Many of them are rescues and there is a book in the living room in which you can read about their past lives. The riding around Sao Miguel is along old farmers tracks that criss cross over the island with occasional road work. I found the horses to be completely bombproof on the road. The highlight of the week is the all day ride to Sete Cidades to see the twin lakes, which have formed in a volcanic crater. Food is a real highlight of the trip with Christina your host cooking 3 course dinners. She also provides an array of fresh fruit from the island for you to sample each morning. There are a variety of non-riding activities on the Green Island trail such as a visit to the Fire lake, located in the crater of an extinct volcano, Caldeira Velha a naturally occurring warm swimming pool, a tea plantation, a pineapple plantation and a whale and dolphin watching trip (this is an additional cost, payable locally, weather permitting). 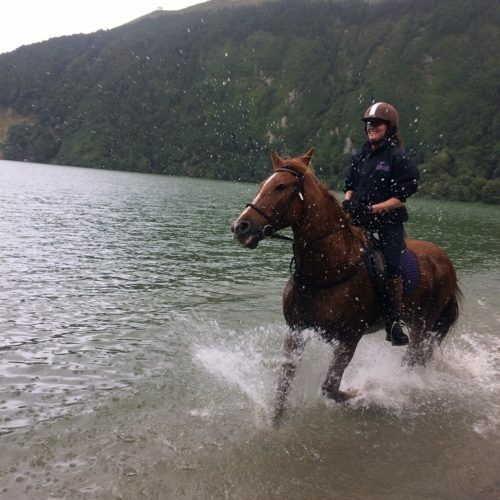 We recommend the Green Island Trail for experienced riders, the Atlantic trail for intermediate riders (happy at walk, trot and canter), Relaxed ride for intermediate riders (happy at walk, trot and canter) and Learn to Ride programme for beginners.